I'm a huge fan of chocolate anything, which you've probably picked up if you ready my blog regularly. In particular, I love dark chocolate, since it both tastes good and is good for me (cocoa is full of antioxidants that promote low blood pressure and good heart health)! 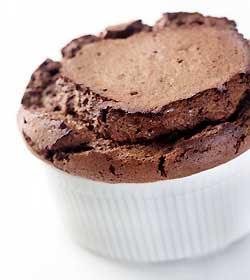 Today I thought I'd write about a fabulous recipe for low calorie Chocolate Souffles that is published and available from the Mayo Clinic Online recipe site. I don't know how, but the Mayo Clinic managed to put together a recipe for Chocolate Souffles that is so yummy that you could probably feed it to your friends without them realizing how low calorie it is (it is only 184 calories with a small side of raspberries, or 3 weight watchers points). (1) When combining the cocoa and whipped egg whites, try to mix as little as possible. Mixing releases the air you just whipped in, reducing the fluffiness of the end product. (2) Don't cook too long. This will take some trial and error since the difference between perfect and over-baked can't be determined by looking at the outside. A toothpick can be a helpful aid. (3) Consider using a more expensive chocolate (especially if you love deep dark chocolate) to make the recipe taste even more "chocolatey" (there are a lot of different options available at Whole Foods, for instance). (4) If your want to splurge a bit while still keeping it low calorie, consider eating it with low calorie frozen yogurt or topping the souffle with a serving of fat free whipped cream. This is a great idea, i am not much of a cook but I am addicted to chocolate. I will have to cook my version! !